New Hampshire’s recently released 10-year energy strategy acknowledged an ongoing fact of life for the state’s commercial and residential sectors: New Hampshire imports 100 percent of its fossil fuels and natural gas. According to the NH Wood Energy Council, New Hampshire pays more than $1 billion annually to import heating oil, with a large chunk of that paid for by businesses, since the state’s commercial sector is the second most dependent on heating oil in the nation, just behind Maine. As energy customers realized again last winter, this dependence makes the state vulnerable to wild market swings and, in the case of natural gas last winter, shortages due to limited pipeline infrastructure. In fact, the growth of a wood/biomass heating alternative for commercial use has been an ongoing under-the-radar trend taking place in more rural areas of New Hampshire. Like the wood stove heating the general store a century ago, biomass heating in the forms of wood pellets and wood chips has become an economically viable option for larger-scale municipal, school and commercial operations. Lured by technological advances, the changing economics of the biomass industry and federal/state rebate programs, scores of schools, municipal organizations, nonprofits and private enterprises have begun to make the switch to wood over the past decade. Niebling, an industry veteran and a partner with the consulting firm Innovative Natural Resource Solutions, believes momentum is on the side of this major shift. After years of research on how best to attack rising energy and heating costs, Littleton Regional Healthcare, parent of Littleton Regional Hospital, installed a $2.8 million wood chip heating system in 2013. 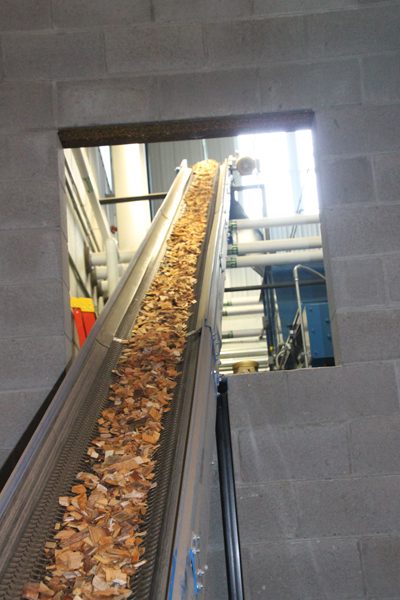 It went fully operational in January and Henri Wante, director of engineering and facilities at LRH, said the two Messersmith automated wood chip heating biomass boilers have replaced three existing oil burners, leaving two burners as a backup to the new system. The LRH project included the installation of a large chip storage bin that can hold two semi-trailer loads of chips – enough for about one week during the peak heating season. LRG’s system includes emissions controls that make it cleaner-burning, with up to 99 percent of all particulates removed before exhaust exits the stack. The nontoxic waste ash produced can be recycled as a source of organic potassium used by farmers. Even though the system has been in operation less than a year, Wante said the financial payback has already begun. Wante said that from January to September 2013, LRH spent $526,000 on heating oil; in 2014 during the same time period the cost for heating dropped to $207,000, including $61,000 for oil to be used as emergency backup and for other operations. Overall, LRH estimated it is using 20 gallons a day of heating oil compared to the more than 1,200 gallons per day of average daily use. There’s another benefit: the money spent on wood chips (about $150,000 through September) is staying in the North Country economy. LRH has a three-year contract for hardwood bole chips with A.B. Logging in Lancaster. “The North Country has taken quite a hit over the years, and keeping this money in the local economy and supporting local industry is important for us,” Wante said. Wante said he expects the entire project will be paid off in five to seven years. Farther south in Pembroke and Loudon, Pleasant View Gardens began its biomass conversion in 2008. Jeff Elkins, the facilities manager, said the company was concerned about “drastically rising fuel costs” that continued to erode the bottom line of its plant material business for growers and garden centers throughout the country. After extensive research and inspections at different biomass operations of manufacturers in the U.S. and Canada, Elkins said a master plan was created. The first biomass system was installed at the Pembroke greenhouse location in 2008, and then a few years later in Loudon. Altogether, the company invested more than $5 million in the systems (a decision helped by more than $500,000 in U.S. Department of Agriculture grants), and it has cut its heating oil costs significantly. At the Pembroke site alone, heating costs dropped from about $1 million a year for No. 2 heating oil to $250,000 annually in wood chips. Elkins expects the investment will be completely paid back in the next four to five years. As with natural gas, wood heating is not a panacea for high heating energy costs. For example, at the consumer level, there was a shortage of wood pellets during the winter of 2013-2014. “It’s still an immature industry,” said Mark Froling of Froling Energy Systems in Peterborough, which has transformed from a biomass manufacturer to a full-service biomass contractor with more than 100 commercial installations throughout New England. Froling said his firm has never been busier than today, but the industry itself is hampered by two vital factors – a consistent wood pellet production infrastructure and financing to help businesses make the switch. But the supply side aspect of the industry is being sorted out, said Froling.